Cherubim - Perfect Knowledge is Theirs! CHERUBIM - PERFECT Knowledge is Theirs to Share! 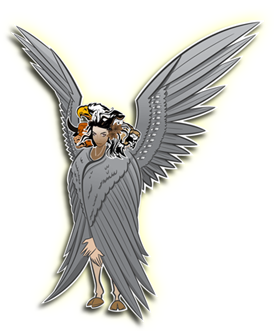 The Cherubim is the second order or Choir in the First Hierarchal Sphere of the Hierarchy of Angels and they are part of the Heavenly Councelors. These hybrid, multi-faceted light beings appear nearly 100 times in the course of the Old Testament, as if to emphasize the significance of what they represent - they are the guardians of light, the stars and God's Throne. They are also depicted on the Ark of the Covenant as its Guardians. The concept of Cherubim is Assyrian or Acadian in origin; the Acadian word "karibu" means "one who prays" or "intercedes". Their rank among angels is uncertain but they are always categorized in the First Hierarchal Sphere normally after the Seraphim. Some believe them to be an order or class of angels; others hold them to be a class of heavenly beings higher than angels. These magnificent beings are said to have perfect knowledge of God, surpassed only by the love of the Seraphim. They are considered the elect beings for the purpose of protection. Cherubs are the first Angels mentioned in the Bible when two Cherubs are placed by God to guard the gates to Eden with Flaming Swords. "He drove out the man; and at the east of the Garden of Eden he placed the Cherubim, and a Flaming Sword which turned every way, to guard the way to the Tree of Life." Genesis 3:24. They were also known as the record keepers of Heaven. They were not described as the cute little "cupid-like" angels depicted by painters, but instead as having four appearances: that of a human, ox, lion, and eagle. According to the Cabalists the human face is said to be symbolic of Divine Man, the eagle's symbolic of the World of Creation; the element of air, the lion's, represents the World of Formation and the bulls features corresponds to the World of Action and the element of earth. t is believed that, although they are removed from man's plane of reality, the divine light that they filter down from Heaven still touches the lives of living things.